Twin brothers Henk and Helmer grew up on a farm in the rural Netherlands, Henk learning to work the farm while Helmer aspired towards an education in Amsterdam. Then Henk and his girlfriend Riet are in a car accident; Riet survives, but Henk is dead at the age of 19. Helmer lost a huge part of himself when Henk died, and then was forced by his father to give up his education and take Henk’s place on the farm. 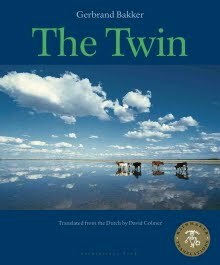 The novel starts many years later, long after Helmer was forced to give up his dreams and take his brother’s place on the farm. His mother has been dead for a short time, and his father’s health is failing. Helmer treats his father horribly - he moves the old man to an upstairs bedroom away from any visitors, tells neighbors that he has lost his mind, feeds him irregularly and barely speaks to him. Now that his father lays dying, Helmer may finally be able to free himself from the responsibilities of the farm. But unexpectedly, Riet returns, bringing with her painful memories of the past and asking for Helmer’s help. This quiet slow-paced novel is one of intense loss and suppressed rage. Helmer is complex, but unable to express himself. I had the impression that he had spent his life just getting through each day without thought of what he really wanted to do, and only when his father became ill did he began to act and make decisions and think about the future. The writing is spare, and I enjoyed the straightforward style. I wonder how much of that is due to the translation, and whether it comes across the same way in the original Dutch. This isn’t one for the Kindle; there is too much pleasure in the physical aspects. I loved the square shape and the heft of this book, as well as the cover art. I realize it’s irrelevant, but it was such a refreshing change from most books I wanted to mention it. It’s too bad this novel garnered so little attention here in the U.S., or maybe I just missed the reviews. Either way, it’s very good and well worth checking out.